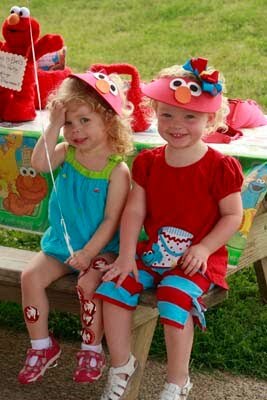 It all started with this Elmo birthday invite from Photo Card Creations. 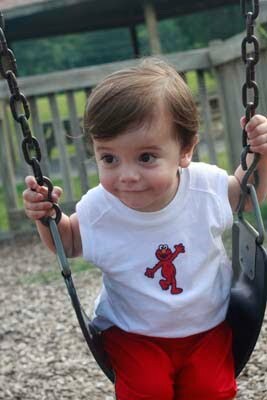 Him in an Elmo t-shirt combined with the “brought to you by the letter E and the number 2” copy was the perfect way to present the Elmo theme. Plus, so many options are out there for cute photo invites. 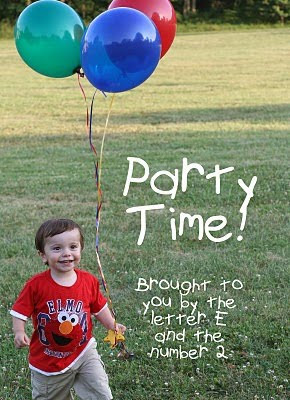 I love using photos on invites because they document Elias’s age in a memorable way! I created the card in photoshop. Elias’s Aunt Angie made him a special birthday outfit. She made the hat using a pattern from Frog Legs and Pony Tails and then made coordinating shorts. I ordered iron-on Elmo patches from ebay (from a vendor in Korea), and added them to the hat and the little white muscle tee. I found everything at the Dollar Store! The clerk told me that they don’t usually have the Sesame Street line, so I think I lucked out. 🙂 Since the party was at a park, I used Elmo baskets to keep everything from blowing away. Strawberries, red grapes and watermelon – all red fruit in honor of Elmo’s red color! Water, milk and juice boxes (no picture, but I covered cheap foam coolers with Elmo decor. They were really cute). 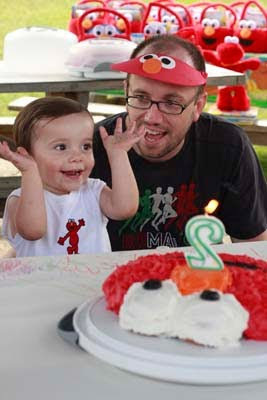 Elias LOVED the cake and kept saying “Elmo cake! 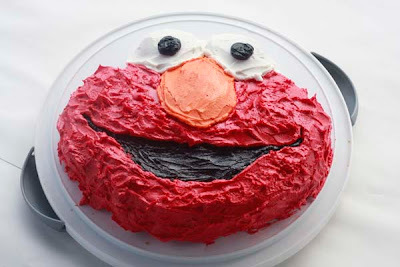 Elmo cake!” After everyone sang happy birthday, he clapped and cheered. It was SOOO cute. A couple details about making this cake: I made two batches of Wilton buttercream frosting- one for the red fur and one for everything else. I also used an entire container of Wilton red no tastecoloring to make the red fur. When I was making it, I was concerned that the red was not red enough, but the red actually gets darker, so it worked out fine. 🙂 And clearly, the kids enjoyed it! 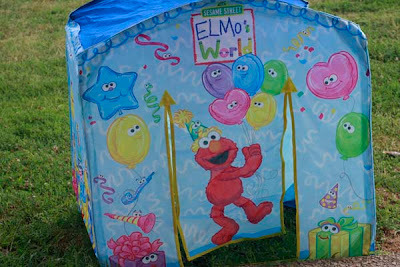 We had a special picnic table, covered in a Sesame Street tablecloth for the Elmo gift baskets and Elmo visors. 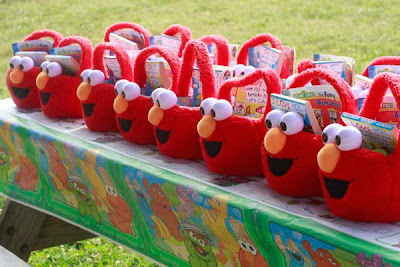 I found Elmo baskets 90% off at Target after Easter. (They had bunny ears on them, but I cut them off.) I went to three Targets to gather up enough for Elias’s party. (They have these Elmo baskets every year at Target.) In each basket was a coloring book, two Elmo Sesame Street books, and bubbles. 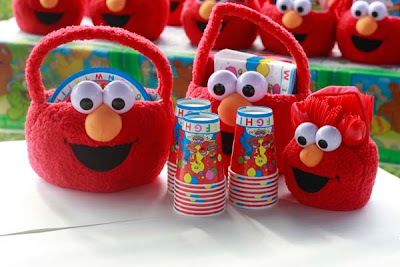 Target’s Dollar Spot often has Sesame Street items, so if you are thinking of having an Elmo birthday party, I recommend scouring this area. I bought all the items 75% off several months ago – planning ahead helps! 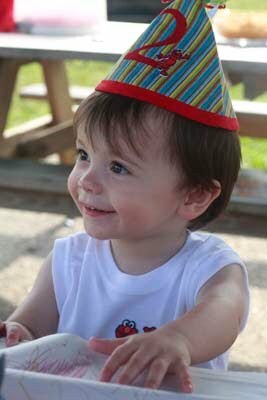 When I saw this design for Abby visors, I just had to make Elmo visors instead of giving out regular birthday hats! They are made of colored foam and I cut everything freehand (as you can probably tell!). I found Aileens Tacky glue to work great on the foam. They were a big hit! 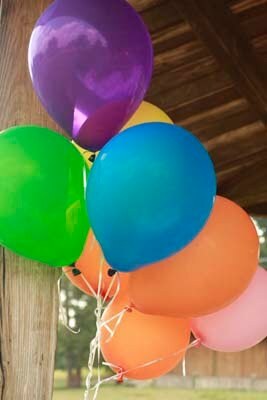 Balloons I love balloons at birthday parties, so we used a Balloon Time helium tank to fill lots of brightly colored balloons and tied them to the outside of the picnic area. It was so festive and inviting. Elmo Fun The tables were covered with white paper so the kids could draw on them. I had several red tins filled with crayons. 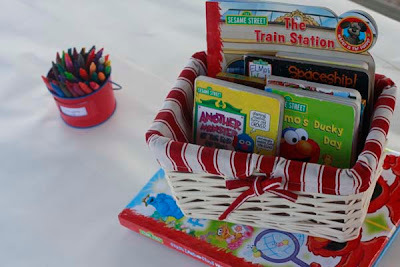 I also had a basket of Elmo board books for the kids to look at. 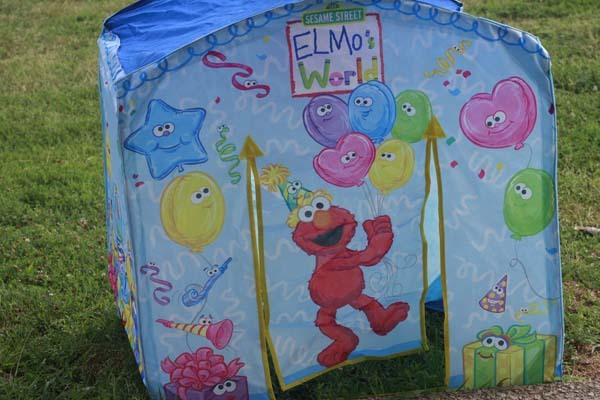 One of Elias’s birthday presents was a little Elmo house (here’s a different Sesame Street playtent) , so we set that up and the kids had fun going in and out of it. 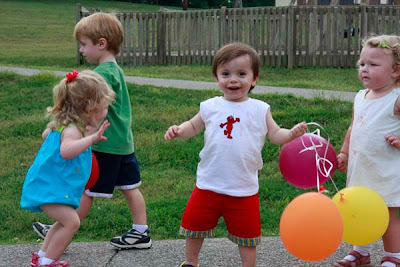 Of course, being at a park meant lots of swinging and running around. We had the party at 9 am, which worked out great. The kids were all really happy and it wasn’t too terribly hot. All in all it was a really fun party! For lots more Sesame Street party inspiration and games, check out my daughter’s Sesame Street party. 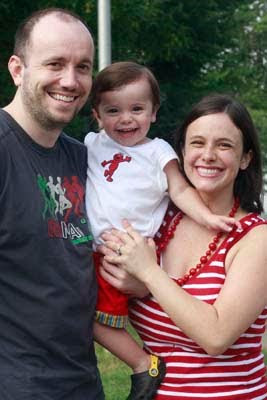 Next article: Happy 2nd Birthday Elias! 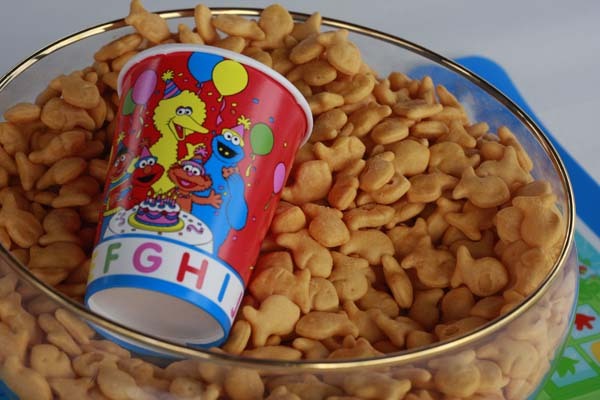 Just came across your post while looking for “Elmo” birthday party ideas…found some great ideas to add to our little guys first birthday party — thank you! 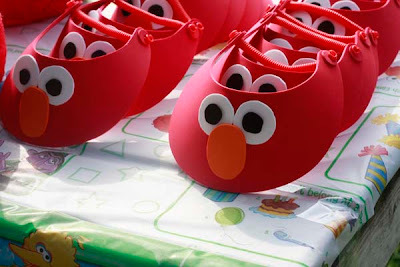 Loved all the Elmo ideas!! The visors were me favorite!! I am doing them for my son’s 2nd birthday. All the ideas are so cute and great! 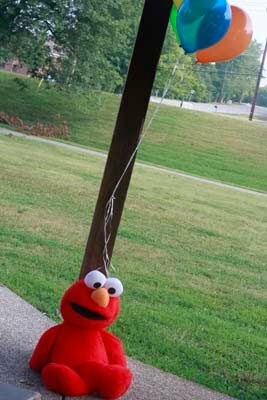 All of the Elmo ideas are great. I really love the Elmo visor idea. Could you tell me how you made them? Thank you so much for sharing your ideas! I will be using a lot of them on my little girls birthday! She will be 2! 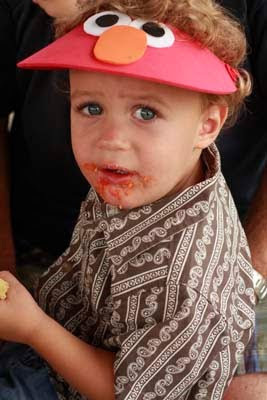 I love your Elmo birthday party ideas, especially your elmo visor. Can you please tell me how you made them? I bought visors at Michaels and then just used adhesive foam to make the faces. 🙂 Very easy. 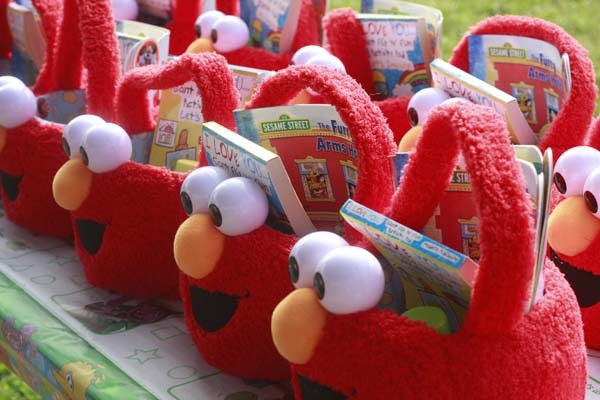 I gave my oldest daughter the Elmo basket for her first Easter, I didn’t think about using it as favor bags. I might have to remember that after Easter this year for my youngest’s birthday. I too like to buy things in advance when they’re on sale. Great Party! 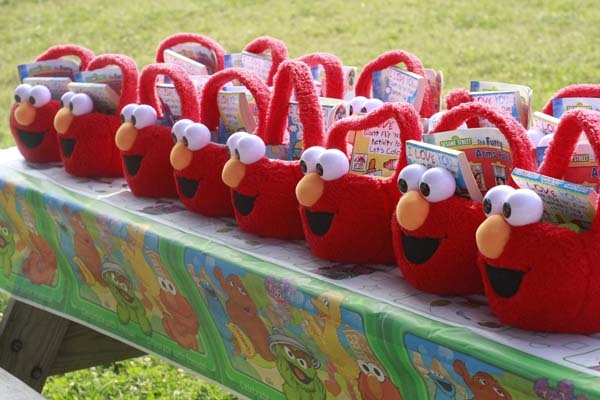 It’s a stretch, but do you have any of the elmo baskets that you would like to sell. I have been searching for them and haven’t been able to find them! Sorry, I don’t! They were used as favors, with the exception of a couple that I kept. 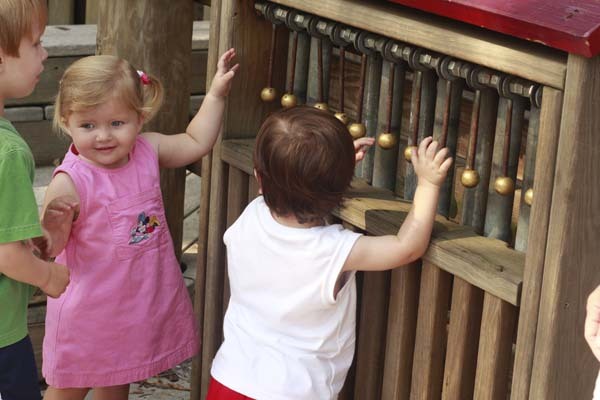 My kids still play with them. Easter is just around the corner. I’m sure you will be able to find them then. The were Easter baskets that I bought at Target on clearance. How did you make the cake? Was it easy? I used a Wilton Elmo cake pan and followed the instructions. It wasn’t hard at all! The bakeries are charging so much for cakes. I love yours. I like the actual shape of Elmo’s face cut out. I just ran across your post. Love your ideas. Especially the Elmo visitors. Did you free hand cut the actual visitor or did you buy red visors? If you bought the visors, can you tell me where you got them from? 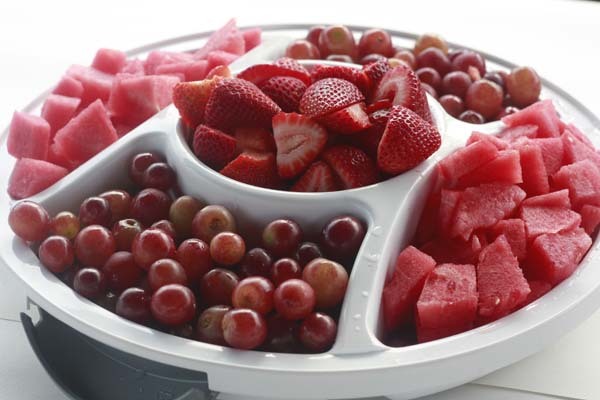 Hi Jess I love all your ideas specially the basket as favors I am looking at Target online and don’t seem to find them….. I realized you did this like 7yrs ago so maybe they don’t have them anymore by any chance have you seen them anywhere else? Thank you for posting your ideas!